Thermoelectric modules, TEG power generator, TEC cooling Module, common differences for technical discriptions. 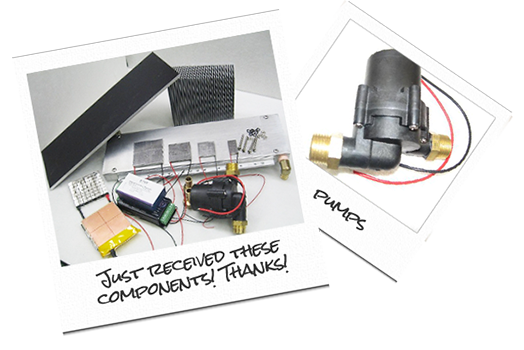 TEG power Charger, Thermoelectric Generator, wood stove Generator, 12VDC Thermoelectric generator trickle Charger. TEG Generator POWER technology has it’s strengths. Because the power densities are very large, small Thermoelectric Generators can be manufactured. For example a 100 watt TEG assembly can fit in an about a twentieth of the space required for an equivalent solar array. As well, the output is 24 hours per day as long as there is a heat source and a cold removal side. So, actual power output could be 6 -7 times what a 100 watt solar array could produce. What is needed to make the technology cheap to operate is waste heat, which by the definition is free. The key words being “WASTE HEAT TEG power generator”. To extract the most efficiency and thermoelectric power from the present state of the art semiconductor materials. It is advisable to have a temperature of 50 to 320°C (122-608°F) hot side for BiTe materials, with a Delta Temperature (DT) of at least 50°C or better. Some applications can work on low grade heat in the 50°C (122°F) range, if the volume of waste heat is high and ample cold side water or air is available. Presently, Bi2Te3 is the most efficient at room temperature. Material such as PbTe, and CMO’s have also been used in temperatures of 350 to 600° C (702-1112°F). Both Bi2Te3 and PbTe are mature material.Their characteristics and performance are well documented and have been used extensively in commercial application. PbTe however, is almost impossible to purchase commercially by itself in module form until now. Starting June 1st, 2014 PbTe will be offered as a Hybrid Thermoelectric module combining the best in class Bi2Te3 P-type with the best in Class PbTe N-Type material to form the first Hybrid TEG modules classed as a TEG1-PB series module. PbTe properties are better suited to temperatures above 300°C so the combination works well in the 300°C to 360°C range. We also carry CMO’s which work at very high temperatures 500°C to 900°C (932°F- 1652°F) and come in both single module construction and also Cascaded (stacked) with Bi2Te3 on the cold side to take advantage of lower temperatures ranges after the higher heat has passed through the CMO material. These Cascades result in an overall efficiency of ~6 to 7 %. 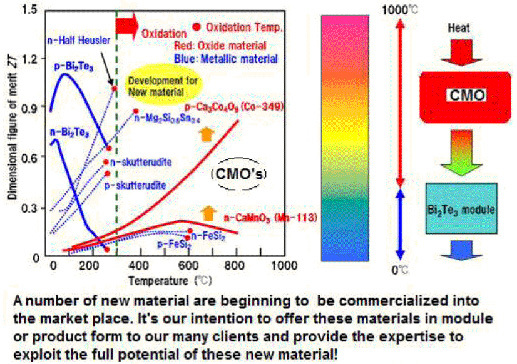 The seven Thermoelectric power materials bottom right are of particular interest as they are fairly abundant materials and less expensive compared to Te (Telluride) based semiconductors and have equal or Greater SEEBECK EFFECT Traits . An additional major factor is toxicity. The material in RED signify benign or exhibit little or no toxicity. 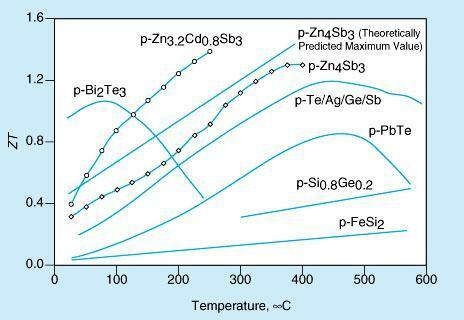 Some of these materials can be discussed on thermoelectric TEG module What’s New located on the Instructable wed site. A typical product that most people are familiar with that using the Bi2Te3 material is the Ecofan. 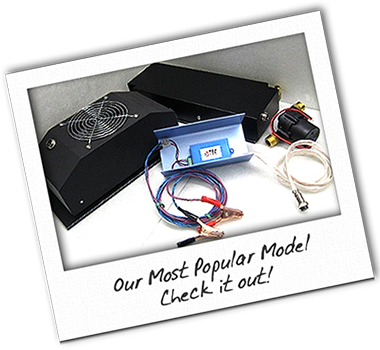 This generator sits on top of a wood burning stove and turns a simple fan using the different temperature (DT) between the wood stove tops temperature and the cooling fins on the top of the aluminum assembly. 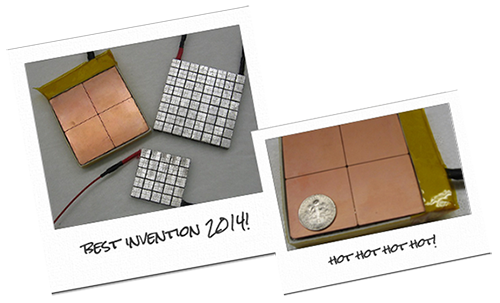 The thermoelectric module is sandwiched in between the hot side and finned cold side.